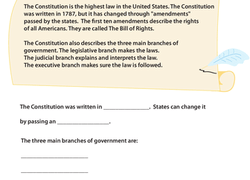 Bring history and geography to life for your third grader with our wide-ranging social studies worksheets. Young explorers will get to know the states and their geography, explore Native American history and culture, and discover the basics of government and the important role they play as citizens. Inject some relaxing fun into the lesson with topical word searches, crossword puzzles, and coloring pages. Board the Underground Railroad and learn a little bit about what life was like for the brave passengers. Looking for a worksheet to help your child with geography? This printable will challenge her knowledge and understanding of reading a map.